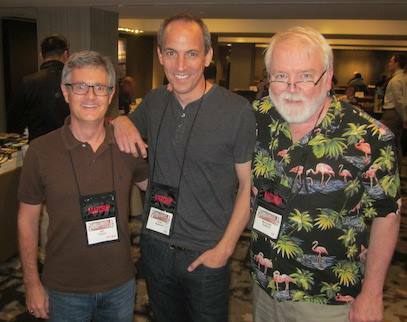 I had a tremendous time at Thrillerfest this past weekend—and while I didn’t bring home the Thriller Award for “Parallel Play,” I had great fun with fellow finalists Eric Beetner and Brendan DuBois mugging for the camera (thanks, Brenda for the photo! ), and the story that did win, Joyce Carol Oates’ “Big Momma,” surely deserves all honors, both for its creepiness and for the precision of its character study of the child at the story’s center. Just wish that another of the finalists, Laura Benedict, had been there to join us as well! Highlights of the whole weekend were many. Much of the official programming was great: the Matchup cocktail party, the Saturday morning Debut Authors breakfast, the chat between Lee Child and Janet Maslin, a great panel on geography and fiction featuring friends Ed Aymar and Wendy Tyson, and then Saturday’s banquet, of course (with cocktail parties before and after!). But as always at conferences like this, it was equally fun to get together with friends and meet new people outside of the formal schedule. I enjoyed lunch with Emily Giglierano, former assistant editor at Ellery Queen’s Mystery Magazine and now an editor at Mulholland Books, and then the next day a pre-cocktail-party cocktail with EQMM editor Janet Hutchings, in part prepping for our Bouchercon event together (see below). Other meals and in-passing chats reconnected with folks I usually only see online, including J.D. Allen, Joe Clifford, Kellye Garrett, Tracee De Hahn, Danny Gardner, Jennifer Hillier, Cheryl Hollon, Christina Kovac, Deb Lacy, Clair Lamb, Dru Ann Love, Jamie Mason, Chantelle Aimée Osman, Peter Rozovsky, Radha Vatsal, LynDee Walker (also my traveling companion on the Amtrak to and from NY! ), Ray Wenck, Ingrid Willis, and Stacey Woodson (I know I’m missing folks here). And it was great to meet a few new folks, including Jeannette Bauroth and Jay Shepherd—whom I’ve known online and yet never met in person until now and now I’m really looking forward to the book he’s working on, for reasons we’ll talk about later! In short, it was a great, great time—my first Thrillerfest but surely not my last. 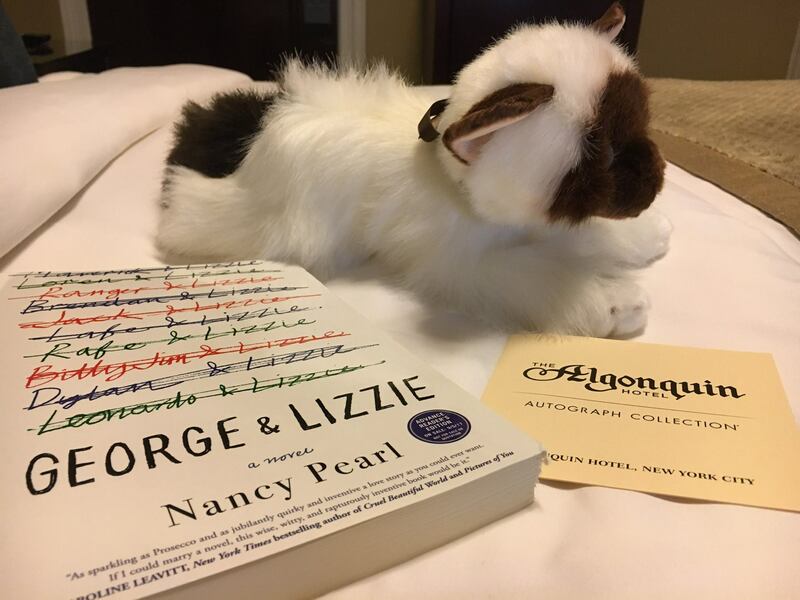 And a bonus: I stayed for the first time at The Algonquin (famed for the Round Table among other things) and already loosely planning another trip back there with Tara and Dash. A beautiful and historic hotel with a distinctive literary heritage, that was already enough to win me over—but the welcome gift surely sealed the deal. Love at first sight for Dash when I brought Mathilda back to him—a stuffed animal version of the real cat who calls The Algonquin home. Looking ahead, here’s a list of other events coming up in the next few months. Next on the calendar is the Suffolk Mystery Authors Festival—an event I first attended last year and am eagerly anticipating this year, such fun! And Bouchercon programming is slowly rolling out too—excited about the events I’m taking part in there too! VIP Meet & Greet, Taylor Ballroom, Suffolk Center for Cultural Arts, 110 W. Finney Avenue, Suffolk, VA • noon-1 p.m. Author Signings, Art Galleries, Suffolk Center for Cultural Arts, 110 W. Finney Avenue, Suffolk, VA • 1:45-6 p.m.
Workshop: “Short, Sharp, Suspenseful: The Mystery Short Story,” with B.K. Stevens, Historical Classroom, Suffolk Center for Cultural Arts, 110 W. Finney Avenue, Suffolk, VA • 3 p.m.
Panel: “From 17th-Century Weavers to 21st-Century Chef: How Research Establishes A Character’s Professional Credibility,” with Maya Corrigan, Barbara Early, Grace Greene, Jenna Harte, Eleanor Kuhns, Shawn Reilly Simmons, B.K. Stevens, and Christine Trent, Birdsong Theater, Suffolk Center for Cultural Arts, 110 W. Finney Avenue, Suffolk, VA • 4 p.m.
Writers-in-Residence Reading with Tara Laskowski, Weymouth Center for the Arts and Humanities, 555 East Connecticut Avenue, Southern Pines, NC • 6:30 p.m. Character Workshop, part of the all-day craft workshop “Take Your Writing to the Next Level,” also featuring presentations by Ruth Moose and J.D. Allen, Triangle Sisters in Crime, Wake Tech Community College, 3434 Kildaire Farm Road, Cary, NC • 9:30 a.m.-5 p.m. Program celebrating Ellery Queen’s Mystery Magazine‘s distinguished contributions to the genre, as host/emcee, interviewing EQMM editor Janet Hutchings and introducing short vignettes from 15 writers with ties to the magazine • Thursday, October 12, 5:30 p.m. Opening Ceremonies, including presentation of Macavity Awards • Thursday, October 12, 7:30 p.m.
Panel: “Meet Your Short Story Anthony Nominees” (as panelist), Grand Centre Room • Friday, October 13, 2 p.m.
Sisters in Crime Breakfast • Saturday, October 14, 7:30 a.m.
Anthony Awards Brunch • Sunday, October 15, 11 a.m. Heading to ThrillerFest—with Fingers Crossed!